Eventually they figured out that Kafka was actually fired years ago, but due to a glitch in the payroll system he kept getting paid. So they fixed the glitch. Troubleshooting: The error message is a line from Kierkegaard's Sickness Unto Death which is often thought of as being very difficult to understand, some even think that Kierkegaard was using the line to make fun of how hard it is to understand Hegel. It is mirroring the classes scene from Office Space where the printer displays "PC LOAD LETTER". Human Resources: In Being and Nothingness Sartre described "The Look" or "The Gaze", which is the phenomenological description of being observed by another, which causes a person to be self conscious, ashamed, and aware of themselves as an object in the world. 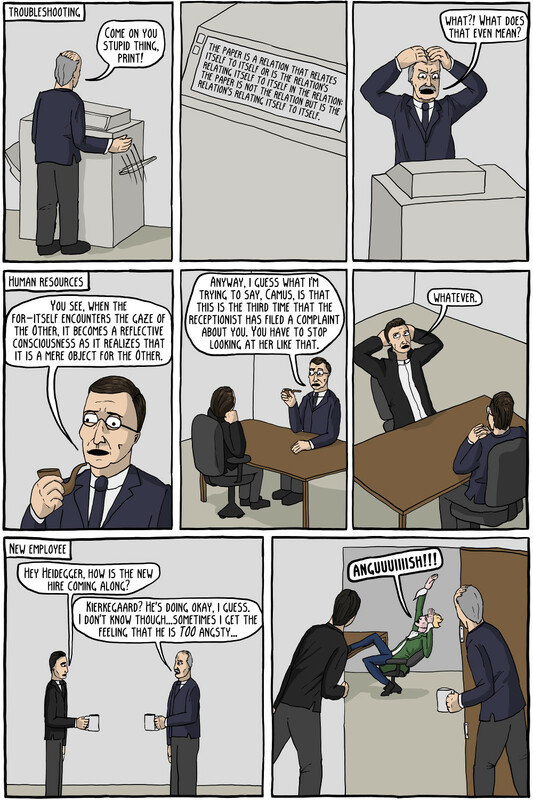 New Employee: Kierkegaard was a pretty angsty dude, even for an existentialist. Staff Meeting: In The Brothers Karamazov many of the characters (particularly Dmitri) were extremely worried that if there was no God, "anything goes" (meaning there would be no morality at all). In his novel The Idiot, Dostoyevsky credited Ivan Turgenev with "inventing nihilism" (referring to Turgenev's novel Fathers and Sons). 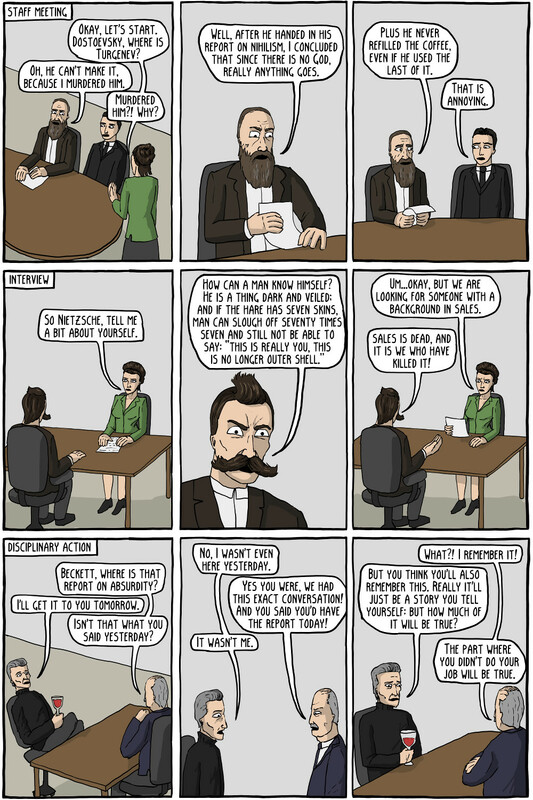 Interview: That's just Nietzsche giving a quote for his job interview. I like to think that Nietzsche would quote himself often in ordinary life, to spice things up. Disciplinary Action: This is referencing Samuel Beckett's famous play Waiting for Godot. 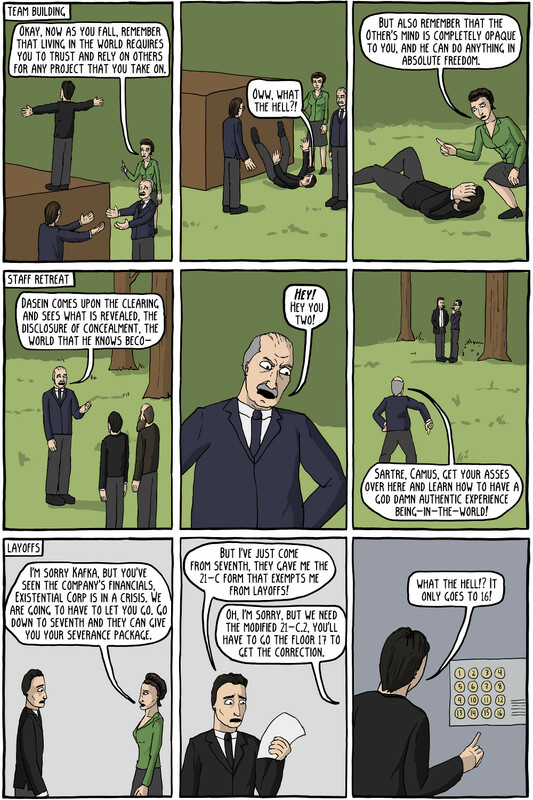 Team Building: This is mostly referencing Simone de Beauvoir's work in how an existentialist can have concrete relations with others, in works such as The Ethics of Ambiguity. Staff Retreat: Heidegger would use things such as walking in a forest and coming upon a clearing as a metaphor for how Dasein (human beings) would come to understand the world. Layoffs: Kafka wasn't a big fan of bureaucracy, on the whole.